Traces of Empire – Video! Some months ago Weston Park Museum here in Sheffield approached me about making a film about how metalwork would have been done in Roman Britain. Most of what I do is related to the Bronze Age, but I jumped at the chance to do something new. We set up a time to go take a look at the brooches they would have on display. After photographing them and taking measurements, I made some waxes and then made some moulds. The process is pretty well explained in the video. I also realised that bag bellows would probably not be the way to go, so I built the bellows that are described in the tutorial on this website. Alan Sylvester, the filmmaker for Museums Sheffield and Lucy Creighton, (now the acting curator of archaeology) both spent long hours at Heeley City Farm helping me build the furnace and pump the bellows. After a day of filming Alan felt he needed more shots of metal being poured, and so we went back for a second day of filming. This time I had some of the pieces I cast earlier, so we could show a bit of the clean-up. It was a great experience. Later I gave a talk at Weston Park Museum about making the film and the importance of experimental archaeology. I also brought along the bellows and some of my tools. If you go see the exhibit, there’s a shorter version of the film on a loop near the display. Posted on 20/11/2014 20/11/2014 Categories About me and my workTags archaeology, bronze casting, experimental archaeology, fibulae, Heeley City Farm, jewellery, lost wax casting, non-ferrous casting, Roman, Roman Britain, Weston Park MuseumLeave a comment on Traces of Empire – Video! While this technically isn’t experimental archaeology, this is a good way to facilitate archaeological experiments in metallurgy. I regularly cast bronze and smelt metals using a small clay-lined pit furnace. However, there are occasions when I am asked to demonstrate Bronze Age metalwork, but am not allowed to dig a hole in the ground. Museums and schools do get fussy about grassy areas and holes that could be a tripping hazard. When I say that I do Bronze Age casting, I have to be honest about it. So far, in Britain no intact Bronze Age furnaces have been excavated or properly identified. The furnaces I used are based on the work of others and best guesses as to how the technology was done. I have used short shaft furnaces, similar to, but much smaller than bloomery iron smelting furnaces. I have also used clay bowl furnaces with the air supply coming across the top or from below. The most efficient type I’ve used is a two chamber furnace with the air introduced into a lower chamber with the charcoal and crucible supported above it. It fires up quickly and evenly, plus it has the advantage that the crucible has a stable support, so I don’t have to worry about spilling the metal because the charcoal is moved around. Step one was to find a sturdy steel bucket and drill a hole in the side near the bottom for the tuyere, the tube through which air is blown into the furnace. The air is needed to increase the heat. 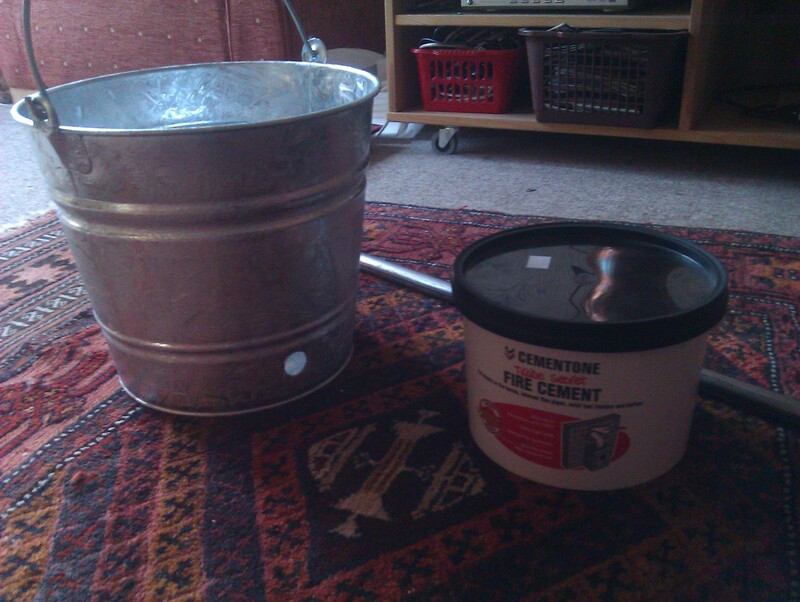 A bucket, a steel tube, and furnace cement. Let’s get going! I had a length of steel tube and a flat drill bit (spade drill bit in the US) of the same diameter. The hole was drilled about an inch and a half above the bottom of the bucket to allow for at least one inch of space for the furnace lining. The view from above. It all fits nicely. The original website used furnace clay, but didn’t say much about it. 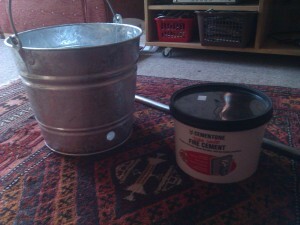 I bought a tub of Cementone Fire Cement for £8 at B&Q. 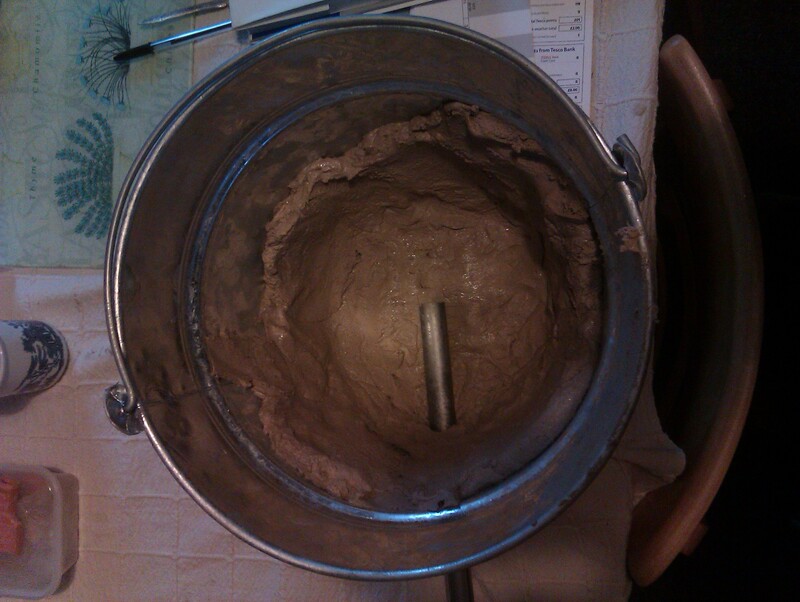 As you can see it did about half the job, with the clay packed about an inch thick. The directions said to use a trowel, however the cement has a texture like gritty plasticene, but not quite as rigid. Getting it smoothed in the bottom of the bucket was awkward with the trowel (I’m more used to removing material with a trowel than adding it) so I put on some plastic gloves and pushed it into place. Now the instructions didn’t say anything about getting it on your hands, it just had warnings about getting it into your eyes. However, knowing that many materials like this can be caustic I decided to err on the side of caution and wore nitril gloves. The container had a handy link to the MSDS (Material Safety Data Sheet) so I could check out all the possible material hazards. The MSDS is a great online resource that will let you know exactly what’s in a product and every possible statistic for it. Check it out here http://www.bostik.co.uk/diy/product/cementone/Fire-Cement/109. Note that it is caustic and there are precautions against getting it on your skin. It also tells you what to do in case of contact with skin or eyes. I used to work with someone who was severely health and safety challenged. I survived, but in the process learned the effects of being too intimately acquainted with carbon monoxide. It should go without saying, but I’ll say it anyway. Do this outside with plenty of ventilation and don’t hover over the thing while it’s being heated. It’s not a barbeque (at least not yet, there’s plenty of time for that later). I took out the tube that I was using for the tuyere and built a small wood fire in the furnace and faced it so the tuyere hole faced the breeze. The fire lit quickly and I kept it topped up with scrap wood and a little charcoal and let the whole thing burn down. Once it was cooled, the material was hard as a rock. The next step was to make the tea pot stand. It’s simply a flat plate that fits the diameter of the interior of the furnace with holes about an inch from the edge. The tea pot stand allows the air to circulate freely below and then up through the holes to increase the heat of the charcoal. Once that was fired the furnace was ready to use. Finished furnace after a few firings. I’ve used the furnace now several times and it holds up well doing high temperature work. My initial fear was that the seams in the bucket wouldn’t hold, but it remains intact after melting bronze and copper. 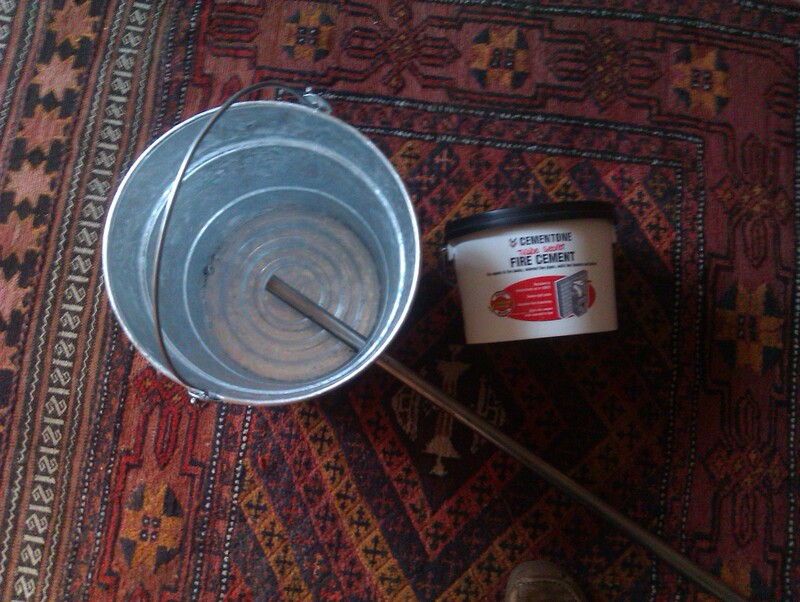 I’ve used it both with bellows and electric pumps. 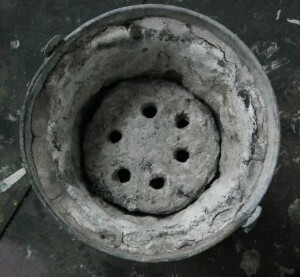 Furnace with tea pot stand (AKA perforated clay slab in place. After I made this, there was some discussion about experimental archaeology and authenticity on the EXARC Facebook Group (a group well worth checking out if you have an interest in any aspect of experimental archaeology). 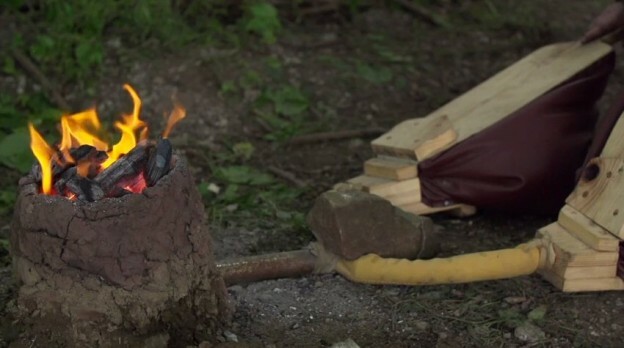 I made the point that this isn’t designed to replicate a Bronze Age furnace, but it replicates the conditions of how we believe Bronze Age furnaces performed. Many early experiments were done using modern gas or electric furnaces, however those have oxygen enriched atmospheres. 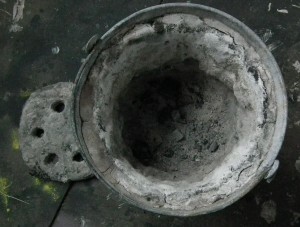 Charcoal fires have reduced atmospheres, meaning that the air immediately around the crucible is free of oxygen. This is good news because less dross and slag is produced since the environment won’t allow the surface of the molten metal to oxidise. As for electric pumps, sometimes it’s valuable to have a controlled air-flow. Having an electric air pump means that I can control how much air goes into the furnace and replicate conditions from one pour to the next. This way I will be able to have multiple experiments conducted under conditions as close as possible to each other. It would be difficult to replicate the controlled airflow of an electric pump with bellows since there might be times when I get tired or there is some distraction and the air flow is slightly less than for the previous pour. Control in these situations is important for experiments where I would I want to compare the melting times of different alloys and need to control as many variables as possible. Another advantage is that this furnace always starts out at the same temperature. While a bowl furnace dug into the ground is well insulated, there are often problems getting it dried out or warmed up after a night of rain. While it’s good to have the experience of getting a cold, damp furnace going, it’s also nice to have one where I don’t use up a couple kilos of charcoal getting it dry and heated. By the way, it’s not only good for metal casting, but with a small grate, it does a good job as a barbeque. I should note that while there haven’t been any of these types of furnaces excavated in Britain, twice now when I have been demonstrating using a small bowl furnace, field archaeologists have told me that they excavated something that looks identical to what I was working with, but didn’t know what it was and wrote it up as a cooking hearth.